David Cameron is not involved in a proposed new town on the site of the former Wisley Airfield, according to the man fronting the project, when challenged by infuriated neighbours on horseback. Mike Murray, of Wisley Property Investments is managing the scheme which would put up to 2,100 homes on the green belt , but he has refused to divulge the identities of his investors, with rumours of involvement by high-profile figures. The project has met opposition from neighbours and campaigners who say Wisley has not demonstrated the ‘very special circumstances’ required to justify such a development in the green belt. Walking back from the site last Friday, Mr Murray was confronted by three neighbours on horseback, including Ingrid Dupre, the former wife of Chris Tarrant. She said she was against the development in principle but that the impact on the area should be considered. “It’s such a negative impact,” she said. “It’s urbanising a rural setting. There have been a number of rumours about where the money for the project is coming from, and although Wisley has an address in the Cayman Islands, Mr Murray said all taxes would be fully paid in the UK. Mr Murray is a Conservative councillor, and the portfolio holder for planning, in the Vale of White Horse, in Oxfordshire. He said if a site like Wisley had been found in his district, it would have ‘made life a lot easier’. 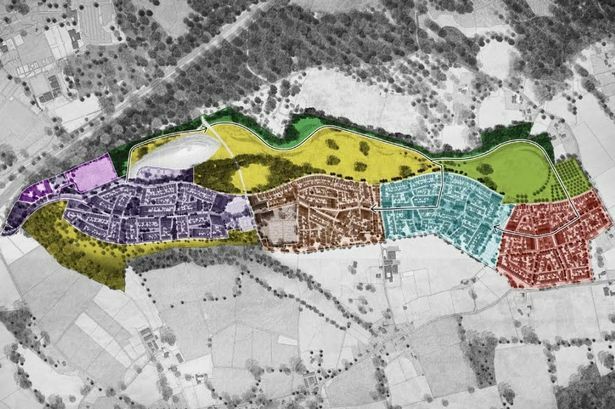 The development would include up to 800 affordable homes , to be managed by housing associations, which would be more than have been built in the borough of Guildford over the past decade. A recent study estimated an affordable housing need of up to 542 new homes a year. The outline plan is expected to go before the planning committee in August and, if granted, Wisley would go into partnership with developers – most likely a number of firms – as the town is built in phases from west to east. A spokesman for the Wisley Action Group, which opposes the development, said: “We all value our privacy but when a massive assault on Surrey’s green belt is proposed, with the creation of a ‘new town’, including some 2,100 houses, the residents of the towns and villages which will be affected may justifiably feel that they have a right to know the identity of the proposers. “It is a matter of record that both Mr Murray and his PR representatives have continually refused to lift the veil of secrecy surrounding the directors of the Cayman Island-based company which owns Three Farms Meadows, the former Wisley airfield, protecting them from reasonable public scrutiny.